Minnesota winters are peaceful and so beautiful! It’s hard to believe but we’ve been making ice for more than two weeks already! We have not ventured out on Bass Lake yet but other locals have. We’ve seen lots of early (crazy?!) fishermen sitting out there on buckets. After the cold weather we’ve gotten for the last several weeks we’re guessing there are 5+ inches of ice out on the lake. It’s been many years since we’ve had measurable ice before Thanksgiving! I took my first walk on the lake today with Kami. She was a happy dog! As I was standing “on” the swimming area I was thinking about a few short months ago when the girls and I were in the same spot swimming under the warm summer sun. As much as I love summer the memory didn’t make me sad because I have to admit that I love winter, too. Today was peaceful and quiet with a fresh blanket of snow on everything and it felt magical. Maybe it’s the holiday season that has me feeling warm and sparkly but regardless of the reason I felt happy! Soon enough we’ll be gearing up for our winter season welcoming back ice fishermen, snowmobilers and our x-skiiers. We’ll play in the snow for a few months and then summer will return. It will be perfect! 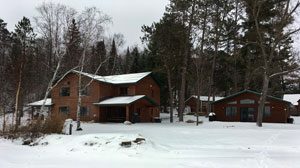 Our cabins are warm and comfortable and are perfect for Minnesota winter vacations! 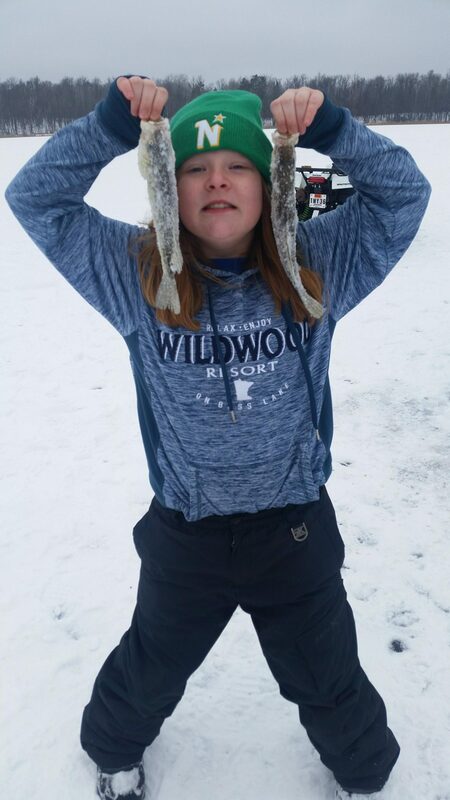 May I suggest that during the approaching holidays you talk with your family and friends about planning a winter trip to Wildwood? The Grand Rapids area is perfect for all kinds of winter activities. 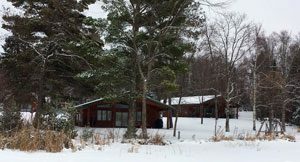 Mount Itasca Winter Sports Center offers downhill skiing and a snow-tubing hill. There are countless cross country ski trails in our area perfect for any skill level and some are lighted x-ski trails! Minnesota Snowmobilers find access to thousands of miles of groomed snowmobile trails and with more than 1000 lakes in Itasca County ice fishermen have their pick of lakes for angling or spearing. Not into outdoor activity in the winter? That’s OK! There are many things to do in our area don’t require winter gear. The Reif Center offers quality performances year-round and since Wildwood is a Hot Lodging partner you have access to the lowest ticket prices available when you book through us. The Children’s Discovery Museum is open on the weekends in the winter offering something to do with the littles when it’s too cold to play outside. There’s also plenty of shopping and dining opportunities. Really there is always something going on locally and you can check out a calendar of things to do on the VisitGrandRapids.com website. Minnesota ice fishing at it’s best! Did my blog post spark your interest? Give us a call or check our availability to book your winter stay with us. We offering our Winter Special again this year so after you stay 2 nights you get a 3rd night FREE! Looking forward to seeing you this winter….